An easy, basic focaccia recipe that only asks for time and creativity – or simplicity – for its topping. This focaccia recipe has seen me through many Sunday nights, football games, and several birthday parties. It’s a crowd-pleaser. It’s useful and easy to use for leftover cheese nibs or those last slices of prosciutto, half a cup of tomato sauce, or the bottom of the marinated mushrooms jar. Why “no-fail?” Because it never fails to come out right. And sometimes, when you’re making dinner for six or eight people, you just want to be sure it all turns out. As for toppings, the American in me says anything goes! The Italian palate says there are some classic pairings and focaccia toppings that, like this recipe, never fail to please. So think of the crowd, and top accordingly. As for the recipe for the dough, it’s an Italian-American mix of influences. Italian because the ragazzo’s mother makes a fantastic focaccia, and I’ve seen her make it plenty of times. American, because eyeballing ingredients like she does stresses me out (I need things to be exact), so I use a certain bread ratio: I am a huge fan of Michael Ruhlman’s Ratio book. I took his bread ratio, simply making it flat, and it became focaccia. Many recipes say to use a higher water content, but then you need a kneading machine because it gets too sticky to knead with your hands. Believe me: most Italian mammas knead with their hands. 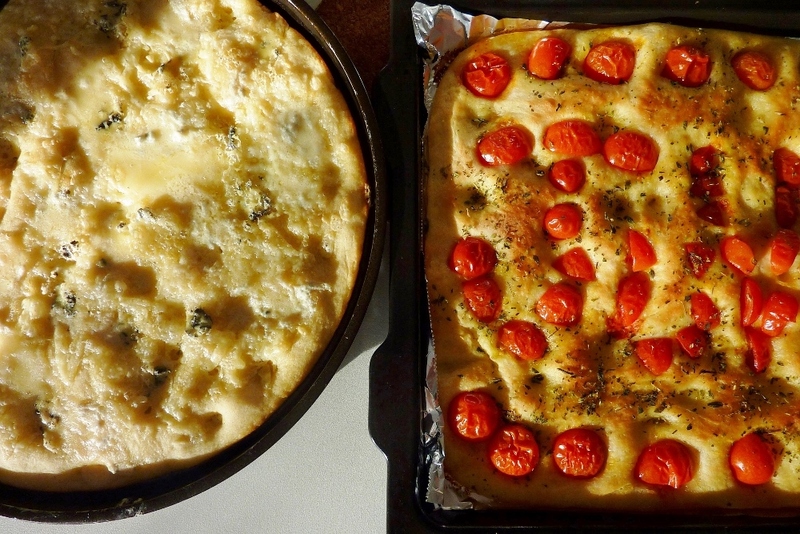 There are different kinds of focaccia you can find up and down the Italian peninsula. I remember a certain bakery in Florence near Santo Spirito that served the best schiacciata that exists; it was almost flaky and had tons of olive oil…delicious! (also, apparently a Florentine dessert exists that’s also called schiacciata, so I’m not sure the why’s and where’s of that – but Dissapore says it’s focaccia). Northern Piemonte has a certified specialty called focaccia di Recco, which layers a paper-thin sheet of dough over creamy Recco cheese. I don’t love the tall, fluffy focaccia that make me feel like I’m eating a white dinner roll with something on top. I go somewhere in between that and a pizza. I also use different flours, giving it a flavor and texture that 100% white all-purpose, or 00 flour, doesn’t. 1) Dissolve the yeast in warm water, adding one tablespoon of sugar. 2) Mix the salt and flours together, then add to the water and yeast. Mix well and knead for 5-10 minutes. 3) Coat the bottom of a large bowl with a bit of olive oil and put in the dough. Let rise, covered, in a warm area for one hour or until double in size. 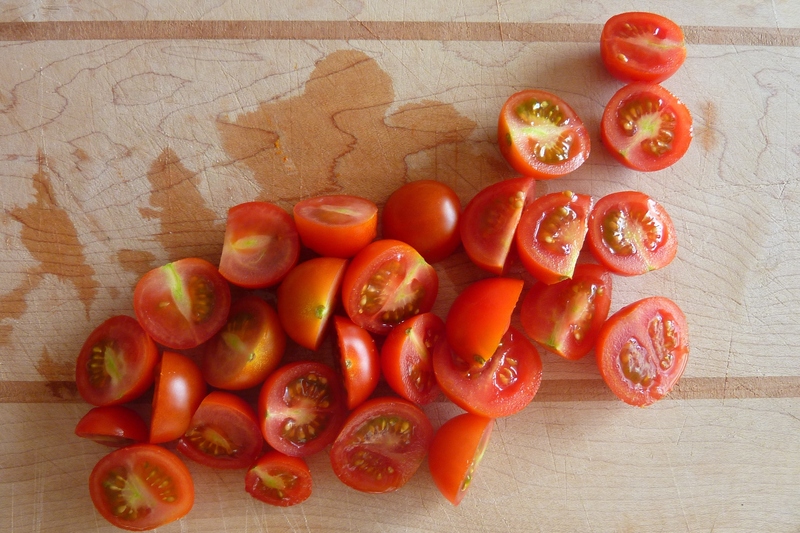 4) Cover two trays with olive oil. Be generous! I always use a 9×13 and a round 12” diameter pan. Stretch out the dough between the two, pushing it into the corners as best you can. Cover and let rise for another 45 min-1 hour. 5) Preheat oven to 375°F. 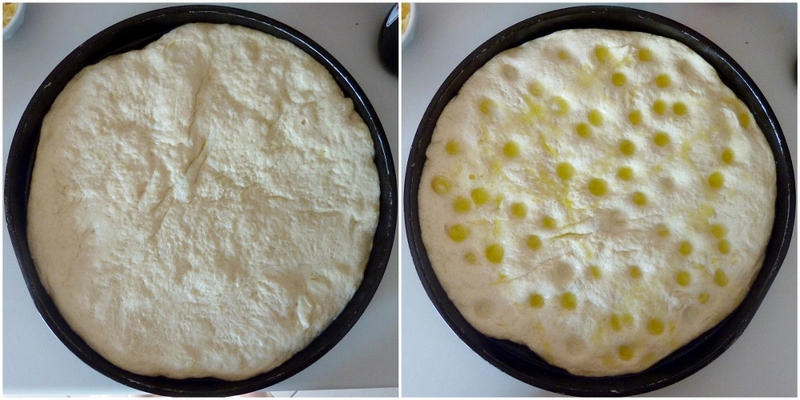 Make indentations in the focaccia, brush olive oil over, and then your toppings. Keep in mind that some salumi are best put on halfway through (depends on the type – you don’t want to cook prosciutto crudo, for example, so just add it during the last minute of cooking). Bake for about 20 minutes, or until cooked through. It’s a fun book! I can lend it to you. It’s very technical, but that’s what I find to be so interesting — it’s like looking through the back door at recipes, and you find out why some recipes require you to mix the wet and dry ingredients separately, or add them in a certain order, etc. Looks so simple. I’ll have to try it soon! Looks delicious AND so pretty!!!!! Okay wow – sounds way easier then a lot of focaccia recipes I’ve seen. What type of yeast do you use here in Italy? I always have trouble finding the right kind as there seems to be so many different types and I never know which type is most similar to the “active dry yeast” I normally find in the U.S.- lievito instataneo, lievito in polvere, lievito fresco, lievito di birra…..? Lievito fresco, the kind that comes in little cubes in the cold aisle with pan brisee and near the cheese…though lievito di birra in polvere works too (and it says on the packet for how much flour to use with it, it usually comes in an amount equivalent for 500 gr flour). I really want to try it with half the amount of yeast and rising for twice the amount of time, which I think would taste even better, but I can never organize myself! This is a great recipe because it is so simple.